sarawestermark: Bach's "St. John's Passion"
Its called "St. John's Passion". I used an old score from Bach's "St. John's Passion" for the paper. It killed me to use a score, but this was a modern adaption by a former choir director who basically edited it and then printed out the scores at a copy shop. It was a score in progress, so there were still edits being made, so it was okay to destroy it. I used the beginning chorale and the first aria. A "passion" is a gospel story about the crucifixion of Jesus. There are four all together written by different authors in the New testament and typically used during Lent leading up to Easter. This particular passage comes from the book of John, hence the name, St. John's Passion. Passions were very popular in Bach's time and later because during lent people refrained from going to the opera house and this was a "blblical dramatiztion", so it was acceptable. Bach wrote hundreds of church cantatas and has a little over three years of church cantatas written--one for every week. These passions are still being performed and they are like sung mini plays. They are not acted out, but there are parts for someone to sing the Narrator often referred to as the Evangelist, Jesus, Judas, and other characters in the story. The piece is largely choral set for a typical church choir interspersed with recitatives and arias. Recitatives are the "spoken-like" sung solo passages with lots of text and the Arias are the solos for characters reflecting on their particular mood. The arias are more melodic. 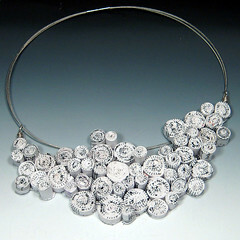 This piece is a made to complete the Etsy Metal Project Runway Challenge, season 6, episode 5. To read more about out challenges coinciding with the hit show on Lifetime (formerly on Bravo), read the etsymetal team blog. Sara! I love what you are doing with all these challenges!!!! Really cool! Great work Sara.